On the Moon, Sam Alexander finds himself face-to-face with the Watcher! Sam attempts to communicate with the alien but the Watcher remains silent. However, he does point to an area of outer space. Nova doesn't see anything but stars and asks for some sort of clue to what he is supposed to be seeing. The giant being's eyes change and the young hero sees a fleet of starships traveling through space! Sam tries to figure out what it all means and concludes that it must be an alien invasion heading towards Earth. He decides to try and contact the Avengers to inform them of the starships. Before he goes, Nova introduces himself to the Watcher. Since the Watcher can't reply, the teenager decides to call him The Pointer On The Moon. On his way back to Earth, Sam is horrified to see that he is on fire from re-entry! However, he is thrilled to discover he is also unharmed but soon is alarmed again when he realizes he is about to crash into his house! Nova is finally able to slow himself down to a gentle landing and goes inside. In the house, Sam's mom confronts him about being gone and speaks in Spanish. Sam tells her that he doesn't understand but gets the point that she is angry. He says he had been out in the garage looking through his dad's stuff to find clues to his disappearance. She tries to stress to Sam that Jesse would disappear at times. However, after Sam was born, Jesse tried very hard to be a good father. The young teen asks his mother if she knows more than she is saying. Sam's mom asks him the same question. They both are silent. Later, out in the garage, Sam still attempts to get his dad's hologram to speak to him from the helmet. 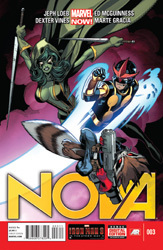 The new Nova turns around to see Rocket Raccoon and Gamora facing him. They tell Sam that the two of them feel he has the potential to be as good as his father. Rocket breaks down in laughter at the thought of Sam being a great hero. The new hero angrily tries to attack the raccoon but ends up facing Rocket's gun! Rocket Raccoon tells Jesse's son that he is the reason Jesse isn't around. Sam asks what happened to his father. Rocket only replies that he was instructed to give Sam the Nova helmet. He also tells the teenager that three billion people are depending on Nova. Sam Alexander slightly panics and tells them to find the other Nova that's on Earth. Gamora informs Sam that he is referring to Richard Rider and and that his attitude is an insult to Rich's sacrifice. Sam realizes that Richard Rider is gone and Rocket Raccoon tells him that he is their only hope now. Later, Rocket is training Sam by blasting at him with his gun while instructing him to never trust anyone! 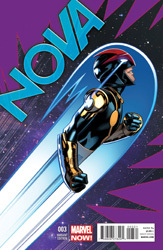 Nova responds by picking up his trainer, throwing him onto the top of his spaceship and blasting his gun out of his hand. Suddenly, Gamora swings her giant blade towards him! The young hero dodges it and they continue training. Sam refuses to compromise on his position of not killing people. Gamora teaches him that the helmet will allow him to fly and breathe in space but it does not make him invulnerable. At the end of their session, the female assassin tells Nova that the threat they are facing is the Chitauri. She explains they are a warrior race who have gained control of the Ultimate Nullifier and plan to use its destructive power on Earth. Rocket further tells Nova that Earth was picked because the Earth heroes have always stopped hostile takeovers in space no matter who is involved. By eliminating the planet with their armada, the galactic empires will be able to conquer at will. The mention of the space armada reminds Sam of what he was shown by the Watcher. After telling his trainers, they figure out that Nova's helmet must be able to see through the Chitauri's cloak. Gamora and Rocket Raccoon change their plans and decide Nova will be a scout since the helmet can log the invaders' coordinates. They will be able to use that information to coordinate reinforcements. Sam agrees to the plan but wants to know how to do a space jump. Later, Nova is flying through space at high velocity and is able to kick into a space jump. The helmet uses the coordinates it gained earlier from the Watcher and Sam Alexander finds himself near Jupiter with the Chitauri fleet heading straight towards him! The lead ship opens fire on Nova with an enormous energy weapon!